It’s time to start getting into the Halloween spirit! One of my favorite past times (when I can find a few minutes!) is to browse pinterest. Usually I am either browsing recipes, crafts, or paper quilling projects. 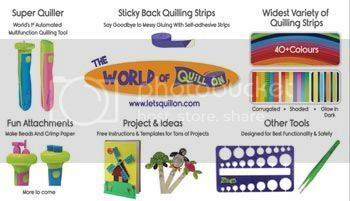 Check out my pinterest profile here, I have several quilling albums! So as I was browsing paper quilled earrings I saw this pair of really cool 3D quilled pumpkin earrings by Marissa from SweetHearts and Crafts on Etsy. I felt inspired to make some Halloween earrings as well, so I came up with this fun witch hat design! I made a few pair so I could experiment with size, length, width, etc. Today I’m sharing with you the final pattern I came up with. I found that using 1/8″ width for the top of the hat worked best, with narrow for the brim. You could use 1/8″ for the brim as well, but then you couldn’t see the orange strip. DO NOT roll your main tight roll very tightly. Roll it snugly, but don’t pull on the end to tighten the whole thing. If you do this, it will make it MUCH harder to push open into a cone shape as the layers will be very tight. First you will need to prepare your strips. Using your slotted tool, roll the 48″ strips (the 1/8″ wide ones) into tight rolls (but not SUPER tight or it will be hard to shape them!!). Leave the narrow 48″ strips unrolled as well as the orange strips. After rolling the tight rolls, dab glue all around the edge and wrap the orange strip around it. Rip off the excess length before gluing down the end. Time to shape the top of the hat! Since you want to shape it into a cone you will need to do it in stages. First use your fingers to shape it into a semi circle. Then take your next biggest tool (I used the end of my slotted quilling tool) and use it inside of your semi circle to get it to be taller. Take care during this process to keep it even and make sure your layers are all a similar distance apart. Meaning you don’t want some of the layers to show most of the width of a strip while others show hardly any gap. Gently push the tool against the inside of the semi circle up and down while turning it to gently make it taller. After all that work getting your hat shaped just right, it’s time to glue the inside so it stays! Squeeze some glue inside and then use a needle tool or toothpick to spread the glue all over the surface. Allow it to dry. Once the inside is dry, you can put on your brim. I use a narrow width (1/16″, 1.5mm) so that some of the orange strip can be seen. Plus it gives a more delicate and realistic look to the hat. You can use 1/8″ width if you prefer, and just leave off the orange strip. Dab glue all the way around and carefully roll up the strip. Glue it shut. 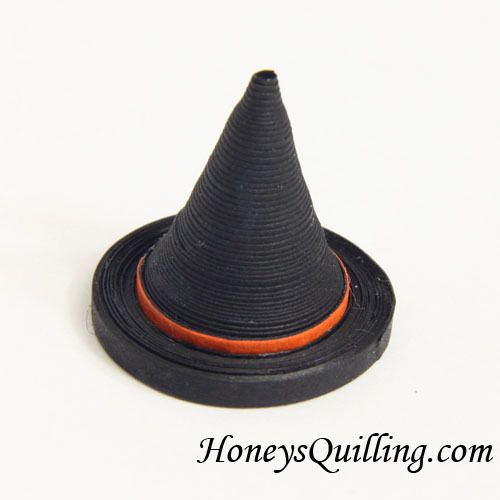 Place the hat flat on a surface and use a needle tool or toothpick to smooth down the brim to make sure it’s all even. Put glue on the bottom to make sure it does not come undone. If you would like your earrings to be sturdy and water resistant (definitely recommended!) you will need to add sealant to them. You can use a small paintbrush to pain on the sealant. Some sealants are clear to start with, while some are white and dry clear. This one that I am using in the photos is liquid matte sealant, which is a very liquid white sealant. It soaks into the paper and dries to make it very sturdy and somewhat water resistant. (Now I usually use Ceramcoat Sealer or DecoArt Sealer which work the same and are available in the US). To make it more water resistant I either add one or two more coats of the same, or add another topcoat such as PPA gloss , diamond glaze , crystal coat glaze , etc. You can read more about different sealants in these posts. Once your hat is sealed and dry, it’s time to put on the findings! Of course you could just use these cute hats as party decorations, favors, table decorations, etc. But if you want to turn them into fantastic earrings, you need to add a headpin and earwire. Head on over to THIS POST for the tutorial on how to do that. Basically you’ll insert your headpin from the bottom out the top, create a loop (that post shows how) and add a jump ring and your earring hook. 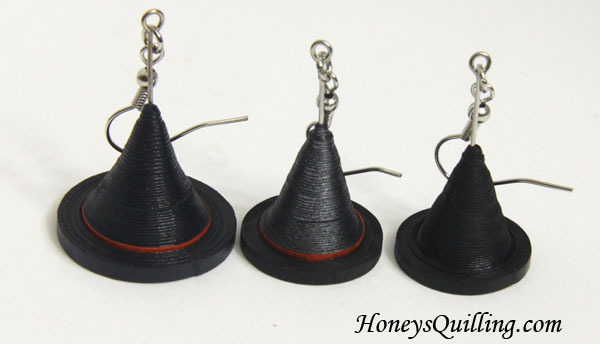 Below you will see three different witch hats, which are three different pairs I made. The left hand one and middle one are the exact same pattern, which I gave in this tutorial. But you notice the size difference! The difference was that the paper I used on the left pair (it was actually a dark navy blue (deep blue by Lake City Craft) but it looks black after putting on the sealant) was a much heavier paper. The paper I used for the middle pair was black pearl from Lake City Craft is a lighter weight. Lake City Craft says that their papers range from 90-120gsm. I’d guess that the deep blue is around 120 while the black pearl just over 100. A heavier paper will give you a bigger circle which will give you a wider hat top! The height of the top will be about the same, though, as that depends on the width of the paper which is the same here. The third, all black, hat was made with all narrow black paper. The black paper is on the lighter side, probably again close to 100gsm. I tried this hat with all narrow because I ran out of plain black 1/8″ width. It was more difficult to create the cone shape without popping the layers apart, but I managed. You can see that it is not as tall as the others. I think using 1/8″ for the top makes for an easier and smooth look, though. There is no orange strip since all strips were narrow, so it wouldn’t have shown if I had added a narrow orange strip. The first photo shows my first attempt. It is 72″ of black (three 24″ strips) rolled into a tight roll, and the middle pressed up into a cone. I didn’t like the result of this as well because if you make more than one it will be hard to regulate how much of the shape gets turned into the top and how much stays as the brim. Also the thicker brim is not as visually pleasant as the thinner brim I think. But if you like the look of it, give it a try! The second photo shows what can happen when you push too quickly on the inside of your cone without paying attention to how far the layers are coming apart. Go slowly! The third photo shows what can happen when using the tweezers to adjust the top of your cone. Don’t pull too far! The last photo shows two attempts using 1/4″ (6mm) width paper. If you wanted to make a much larger hat, then this paper would be the way to go. But with this size of earring, it just looks awkward with the wider paper. The one on the left is 24″ while the one on the right is 48″. this is amazing to make a hat an its very cool to…keep it up..
can u plz tell me which wire can b used in making my own golden jumprings. How cool is this?! Wow, I love this and what a great gift idea! Fabulous project!Thanks so much for joining us in the challenge at PDE Linky Party! Hope you come join us again! What a cute idea but looks a wee bit fiddly for me. Cool! I’ve never made anything like this before. It looks awesome! A lot of work involved to make these but definitely all worth it. Thanks for linking up to #Halloweenlinky Week 3 is live now.